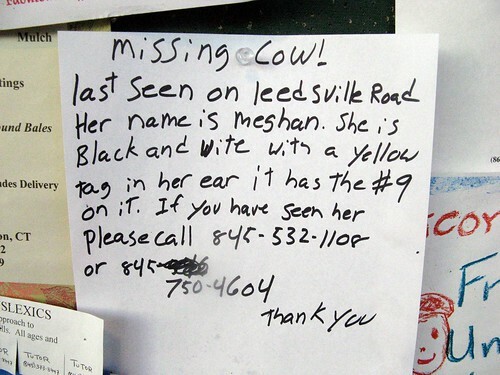 lost cow, originally uploaded by jahansell. In this case, an Amber Alert seems unnecessary, but maybe a Meghan Alert! It's awfully cold out - she's probably very hungry by now! Well at least you don't have to worry that she's been hit by a car! and her name is Meghan. I'm afraid we didn't have this story, but we do occasionaly see headlines in the state police blotter that say "Car vs Cow." Not a notice I see very often . . .
Young cows often are very curious and want to visit around their field...I remember about 10 yaers ago, there was a farm just in the middle of my little town Arradon (it sounds strange now, so many things have changed since...)and I often noticed one or two cows bolder than the oldest. I hope this one will be back soon!